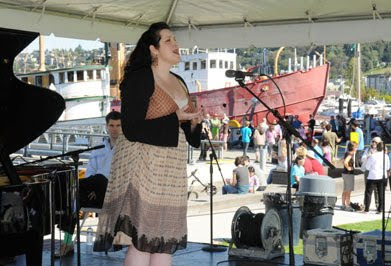 Today we hear from Justina Schwartz, Seattle Opera's education events manager, who was on hand for this weekend's performances at Festa Italiana and the grand opening of Lake Union Park. This past stunning Saturday, Seattle Opera set out to bring music to the public. Our day began at the Lake Union Park Grand Opening Celebration. The newest waterfront park in Seattle was already bustling by early morning, featuring sights, sounds, and activities for all ages and ability. There were long boards, model boats, delicious food, historical ships, rock music, break dancers, bubbles, and—of course—opera. Seattle Opera Young Artist Marcy Stonikas performs at Lake Union Park. Photo by: Bill Mohn. 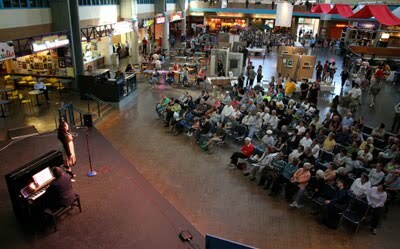 Seattle Opera Young Artists Marcy Stonikas and Erik Anstine took the stage at 12:50, and were accompanied by Principal Coach-Accompanist David McDade, with Education Director Sue Elliott setting the scene for each aria. The audience was treated to a little Tosca, Don Giovanni, Susannah, Die tote Stadt, and The Marriage of Figaro, before a stunning finish with an aria from La Wally. The backdrop of South Lake Union, with boats of all shapes and sizes on the water, was a serendipitous operatic display. Taking a break from music and enjoying one of Sound Experience's schooners. From left to right: David McDade, Erik Anstine, and Marcy Stonikas. Photo by: Bill Mohn. Our next adventure of the day took us to a more established city landmark: Seattle Center. Every year, in conjunction with Seattle Center’s Festal series, Italian culture takes over a part of its campus for Festa Italiana. We’ve partnered with the festival for the past few years, which is particularly fitting considering so many of our productions—including half of this season’s—are in Italian! Stonikas sings for the crowd at Festa Italiana. Photo by: Alan Alabastro. My favorite thing about these events is the moment we reach someone new, like a member of the community who happens to stroll past our stage just in time for a certain note to catch their attention. In that brief moment, that single note has sparked a love of music. I am sure we can all relate to that feeling.